The A12 motorway is a motorway in the Netherlands. The road connects the city of The Hague with the German border, near Zevenaar, and the German Autobahn BAB 3. On its way, it crosses three Dutch provinces: South Holland, Utrecht, and Gelderland. The European route E30 follows the A12 between interchange Prins Clausplein near The Hague, and interchange Lunetten, just southeast of the city of Utrecht. The European route E25 runs along the A12 between interchange Gouwe near Gouda, and interchange Oudenrijn, just southwest of Utrecht. 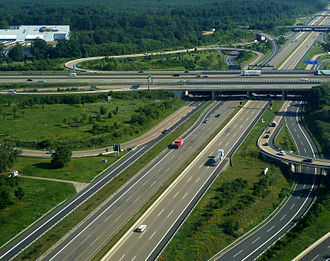 The European route E35 follows the route of the A12 from interchange Oudenrijn towards the German border. A12 as highway in The Hague. The section of the A12 road within the city of The Hague (near exits 1, 2 and 3) is actually not a motorway, but a highway. This part of the road, known as the Utrechtsebaan, is too narrow to meet the Dutch requirements for a motorway (for example, it does not have a shoulder), and is therefore a highway with a maximum speed of 70 km/h. To avoid local traffic from using this heavily congested part of the road, exits 2 through 4 are built as incomplete exits. These exits only feature westbound exits and eastbound entrances, so they can only be used by interlocal traffic. Local traffic is therefore forced to make use of the available local roads. In 2008, a government programme on route branding, under an umbrella project in urban planning, put stickers on all streetlights of the A12, citing efforts to give it a "route 66-like" allure. This plan, dubbed the "regenboogroute" (rainbow route), received news coverage because of its alleged trivial results (stickers on streetlights) and high costs (€120 000). 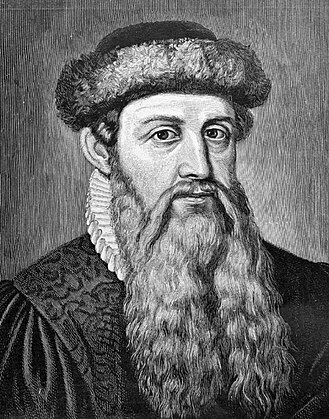 Wikimedia Commons has media related to Rijksweg 12. Voorburg is a Dutch town and former municipality in the western part of the province of South Holland, the Netherlands. Together with Leidschendam and Stompwijk, it makes up the municipality Leidschendam-Voorburg and it has a population of approximately 39,000 people. 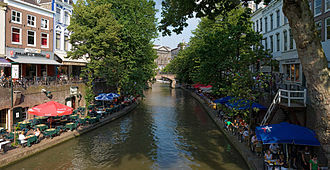 It is considered to be the oldest city in The Netherlands, in 2002, the cities of Leidschendam and Voorburg were merged under the new municipality named Leidschendam-Voorburg. 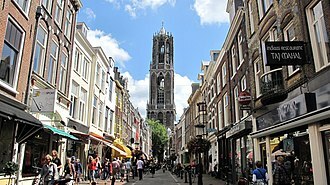 Situated adjacent to the city of The Hague, it is regarded as one of its suburbs. It was positioned along the Fossa Corbulonis, a canal connecting the Rhine and this waterway is now known as the Rijn-Schie canal and is still a dominant landmark of the present day borough. 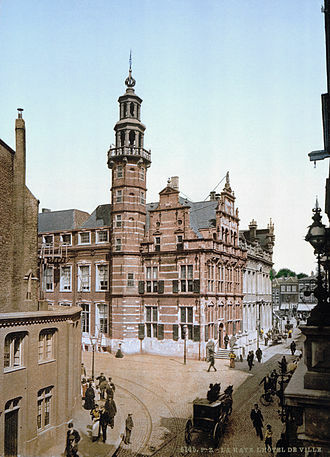 His son, the astronomer and mathematician Christiaan Huygens, spent several years in his fathers country house in Voorburg. The house, located next to the railway station, now functions as a museum. 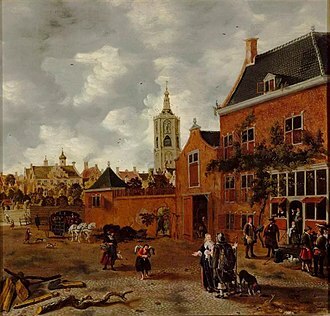 Philosopher Baruch Spinoza lived in Voorburg from 1663 to 1670, in Voorburg, Spinoza continued work on the Ethics and corresponded with scientists and theologians throughout Europe. With 139,000 km of public roads, the Netherlands has one of the most dense road networks in the world – much denser than Germany and France, but still not as dense as Belgium. Dutch roads include at least 3,530 km of motorways and expressways, and with a density of 64 kilometres per 1,000 km². The Netherlands main highway net, comparable to Britains net of roads, consists of most of its 5,200 km of national roads. 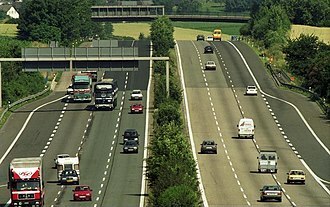 Although only about 2,500 km of roads are constructed to motorway standards. Except for motorways and expressways, most roads support cyclists, some 35,000 km feature dedicated cycle tracks, physically segregated from motor traffic. A further 4,700 km of roads have clearly marked bike lanes, busy junctions sometimes give priority to cyclists, and in street roads like fietsstraten and woonerven, bicycles always have priority over cars. Since 1997, a traffic safety program called Duurzaam Veilig has had a major impact on the road network. Traffic calming has been applied on a massive scale, a popular calming measure is to replace intersections by roundabouts, of which there were almost 5,000 in 2015, both in and out of town. The countrys first centrally-planned highway system dates back to the early 19th century, when Napoleon was emperor of France, in 1811, Napoleon decreed that a network of 229 paved imperial roads would be created, extending from Paris to the borders of his empire. In addition to paving, the roads were all numbered. 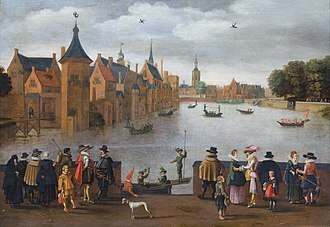 Construction of several imperial highways through Holland commenced, Amsterdam was connected to Paris by Route Impériale no. 2, a section between Amsterdam and Utrecht is today still a part of the A2 motorway, after the countrys liberation in 1813, Hollands new king continued the project but with Amsterdam at the centre. 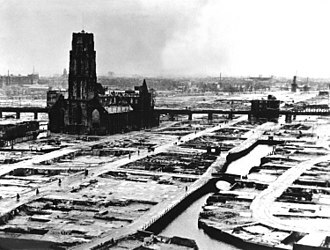 The plan was expanded several times, in 1821, it projected 42 Rijksstraatwegen, which were built until 1850. Since 1927, this network was transformed into todays system of Rijkswegen in the Netherlands, the first motorway dates back to 1936, when the current A12 was opened to traffic between Voorburg and Zoetermeer, near The Hague. Motorway construction accelerated in the 1960s and 1970s but halted in the 1980s, current motorway expansion mostly occurs outside the Randstad. European route E35 is a north–south European route, running from Amsterdam in the Netherlands to Rome in Italy. In the Netherlands, the runs from its northern terminus in Amsterdam eastwards through Utrecht and Arnhem to the German border. The highway is maintained by Rijkswaterstaat, E35 begins in northern Amsterdam at an interchange with A10 / E22 and A8 / E22, where it runs to the south–east concurrently with A10, the orbital road around Amsterdam. After running across these waters, the approaches the Watergraafsmeer interchange. The road continues around Amsterdam and runs westwards to the Amstel interchange just before bridging over the Amstel river, at this interchange, E35 splits off of A10, which is signed E19 from this point on, and continues onto the emerging A2 southwards. On A2, the highway leaves Amsterdam and continues southwards to get to the Holendrecht interchange with A9. This interchange is divided into two parts, starting with an interchange, where A9 joins the road from the east. At the second part, an interchange, A9 splits off of the road again. Exit 2, an exit of A2 with a northbound exit and southbound entrance to Amsterdam-Zuidoost. Running further southwards, the leaves the province of North Holland just after crossing over the Holendrecht river. Running through western Utrecht, the highway close to the Oudenrijn interchange with A12 / E30 / E25. 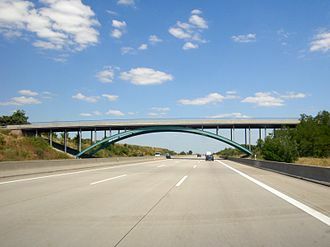 At this interchange E35 joins A12 / E30 to the east, concurrent with A12 / E30, the highway runs eastwards and after some 2 kilometres it crosses over the Amsterdam–Rhine Canal using the Galecopperbrug. Continuing further to the east, E35 moves towards the Lunetten interchange with A27, at this interchange, E30 splits off to the north, now concurrent with A27. From this point on running with A12, the road carries on to the east, crossing the Kromme Rijn river at exit 19 near Odijk. Just passed exit 20, where N225 starts its journey to the south in Driebergen, E35 enters the Utrecht Hill Ridge, the road leaves the province of Utrecht and enters Gelderland between Veenendaal and Ede. Gelderland is a province of the Netherlands, located in the central eastern part of the country. With a land area of nearly 5,000 km2, it is the largest province of the Netherlands and shares borders with six other provinces, both Nijmegen and Apeldoorn are larger cities, Nijmegen being the largest with nearly 170,000 inhabitants. Other major regional centres in Gelderland are Ede, Zutphen, Wageningen, Gelderland had a population of just over two million in 2015. 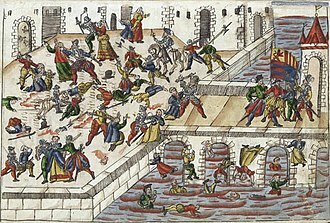 According to the Wichard saga, the city was named by the Lords of Pont who fought and they named the town they founded after the death rattle of the dragon, Gelre. 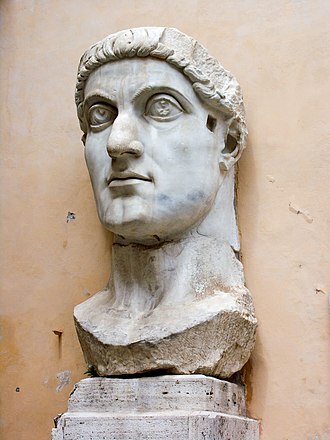 Historically, the dates from states of the Holy Roman Empire. The County of Guelders arose out of the Frankish pagus Hamaland in the 11th century around castles near Roermond, the counts of Gelre acquired the Betuwe and Veluwe regions and, through marriage, the County of Zutphen. Thus the counts of Guelders laid the foundation for a power that, through control of the Rhine, Meuse. Many wider U. S. as well as Swedish freeways have shoulders on both sides of each directional carriageway, in the median as well as at the outer edges of the road, for additional safety. Shoulders are not intended for use by traffic, although there are exceptions. Shoulders have multiple uses, including, In the event of an emergency or breakdown, Emergency vehicles such as ambulances and police cars may use the shoulder to bypass traffic congestion. Active traffic management, used on busy roads, may allow hard shoulder running by general traffic at reduced speeds during periods of high traffic volumes. In some places a Bus bypass shoulder may be provided which allows bus services to pass stationary traffic, paved shoulders provide additional space should a motorist need to take evasive action or need to recover control of their vehicle before a run-off-road collision occurs. In some urban areas, shoulders are used as travel lanes during peak commuting hours, in some rural areas without sidewalks and cyclists may be allowed to walk or ride on the shoulders. Paved shoulders move water away from the roadway before it can infiltrate into the roads subbase, Shoulders help provide extra structural support of the roadway. The shoulder is slightly narrower than a full traffic lane. 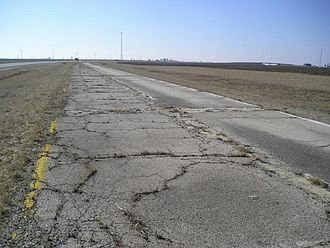 In some cases, particularly on older rural roadways, shoulders that initially existed were hardened with gravel rather than being paved with asphalt or concrete, in Britain, motorway shoulders are now paved, but are still known as hard shoulders. Older, gravel shoulders have sometimes been termed soft shoulders by comparison, because the paved surface ends at that point, they are less safe if they need to be used for emergency maneuvers. Modern practice is to build a paved shoulder whenever possible. The Safety Edge is effective on roads where the shoulder is narrow or nonexistent. To save money, the shoulder was not paved to the same thickness as the through lanes, so if vehicles were to attempt to use it as a through lane regularly. In Britain, shoulder running can occur during roadworks, and full depth construction is now standard, in some metro areas, road authorities allow shoulders to be used as lanes at peak periods. The international E-road network is a numbering system for roads in Europe developed by the United Nations Economic Commission for Europe. The network is numbered from E1 up and its roads cross national borders and it reaches Central Asian countries like Kyrgyzstan, since they are members of the UNECE. European main international traffic arteries are defined by ECE/TRANS/SC. 1/384 which consider three types of roads, express roads, and ordinary roads, in most countries, roads carry the European route designation beside national road numbers. Other countries like Belgium and Sweden have roads with exclusive European route signage, while at the end of the scale. Denmark uses exclusive European routes, but uses formal names for every motorway, other continents have similar international road networks, e. g. the Pan-American Highway in the Americas, the Trans-African Highway network, and the Asian Highway Network. UNECE was formed in 1947, and their first major act to transport was a joint UN declaration no. 1264, the Declaration on the Construction of Main International Traffic Arteries, signed in Geneva on September 16,1950, originally it was envisaged that the E-road network would be a motorway system comparable to the US Interstate Highway System. The AGR last went through a change in 1992 and in 2001 was extended into Central Asia to include the Caucausus nations. There were several revisions since, last in 2008. The route numbering system is as follows, Reference roads and intermediate roads, north-south routes have odd numbers, east-west routes have even numbers. Numbers count upward from west to east and from north to south, with some exceptions, branch and connecting roads, called Class-B roads, have three-digit numbers above 130. Reference roads are roads numbered 5-95 ending with 0 or 5 or having odd numbers 101-129 and they generally go across Europe and are usually several thousand kilometres long. North-south reference roads have numbers that end with the digit 5 from 5 to 95, or odd numbers from 101 to 129, east-west reference roads have two-digit numbers that end with the digit 0, increasing from north to south. A remnant of an original state right-of-way marker serves as a reminder of the early days of the road's construction. This was part of the 1927 construction of US 66. 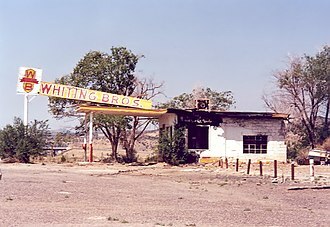 Abandoned, fire-damaged Whiting Brothers gas station. All along the route, preservation efforts are under way to preserve original buildings such as this. A4 entering the Schiphol tunnel from the south. Dutch scenery along A4 with windmill "Zelden van Passe" near Zoeterwoude. A4 south of Delft on 20 December 2015. Right (northbound) lanes are already opened for traffic; left (southbound) lanes are still closed and are expected to be opened later in the day. A traffic-calmed street with wide advisory cycle lanes (red) that motorists may use to pass oncoming cars. Drivers must use them safely though and not crowd out the cyclists. E3 in Denmark, before 1992: Changed to E45; the number E3 was re-attributed. Reference to A58 and A27 on the A16.